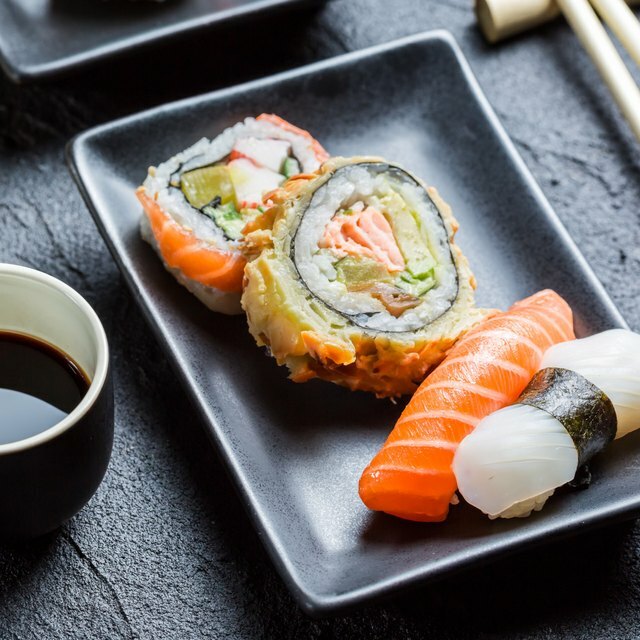 Although many types of sushi are low in calories and fat, cucumber and avocado rolls are high in both, largely because of the avocado, which is high in fat (but the good kind of fat!). Understanding the nutrition facts will help you fit this type of sushi into your diet. LIVESTRONG's food database MyPlate says that one serving of cucumber and avocado roll contains 370 calories. According to the Mayo Clinic, it would take more than two hours of walking at a two mile an hour pace to burn off this number of calories. A serving of cucumber and avocado roll contains seven grams of fat. Only one gram of this fat is saturated fat, which can increase your cholesterol levels, according to the American Heart Association. A serving of cucumber and avocado roll contains 70 grams of carbohydrates. Of these carbohydrates, eight grams come from dietary fiber. According to the National Institutes of Health and National Library of Medicine, you should consume 40 to 60 percent of your calories from carbohydrates. Cucumber and avocado rolls are low in protein -- a serving contains just six grams of protein. According to Healthline.com, the average man with a low activity level should consume 56 grams of protein per day, while the average woman with the same activity level should consume 46 grams of protein daily.